Heavy-duty flow meters are fully enclosed in a brushed stainless steel case. Ideal for industrial applications. Used with industrial water and air service. Fluted or plain tapered tubes. Direct reading metric and English system scales. Unique design facilitates ease of maintenance cleaning processes. Meters are graduated for direct reading of water and air. 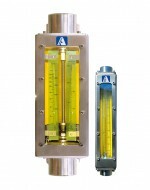 Flow meters come with FNPT end fittings for easy in-line installation. Wetted parts include borosilicate glass flow tubes, Viton o-rings, and 316 Stainless steel fittings, guide rods, floats and float stops. Accuracy ±3% of full scale. Min. Flow Rate Approximately 10% of maximum flow rate. Repeatability ±0.5% of full scale. Max. Pressure (at 93°C) 200 psi (tube sizes 3, 4, 5 and 6), 125 psi (tube sizes 8 and 9).